On Top of Mt. Everest, All Covered With Cheese…. Hello everyone to another edition of Mastication Monologues! Even though the weather in Korea doesn’t know how to make up its mind, today was a beautiful day. So I went out for a mini-adventure in Incheon. 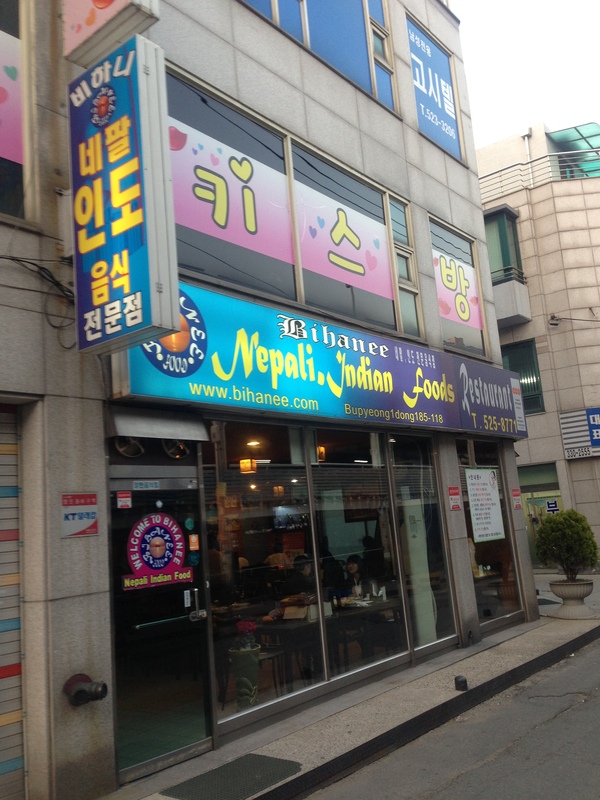 I also wanted to find an interesting restaurant on the internet in Incheon, and eventually I landed on a cuisine that I never had before: Nepalese. The only things I really know about Nepal is its proximity to India, being home to the mysterious Yeti, and of course, Mt. Everest. The food? No clue. So after making my way to a local point of interest and hiking a mountain, I made my way to Bihanee Restaurant located right by Bupyeong Station in Incheon. Upon entering, I was greeted by a Korean hostess/waitress which made me a bit nervous since I’ve seen what Koreans do with pizzas (mustard and shrimp, anyone? ), so I was curious as to why they would specialize in Nepalese and Indian food. After sitting down for a bit, all of my questions were answered when a man, who I assumed was the owner, came up to me and asked me how I was doing. He seemed to be of Indian descent, and I saw his cook who looked Nepalese. So much for the Korean smokescreen at the door. Anyway, I ordered the Murg Malai Kebab (10,000 W) and a side of Himali naan (4,000 W). I also appreciated the gigantic carafe of free, ice-cold water that really quenched my thirst after trucking up the mountain. After patiently waiting, my food finally came out. It was arranged in a very tasteful manner, and the owner explained what the sauces were that came with it without even being prompted. 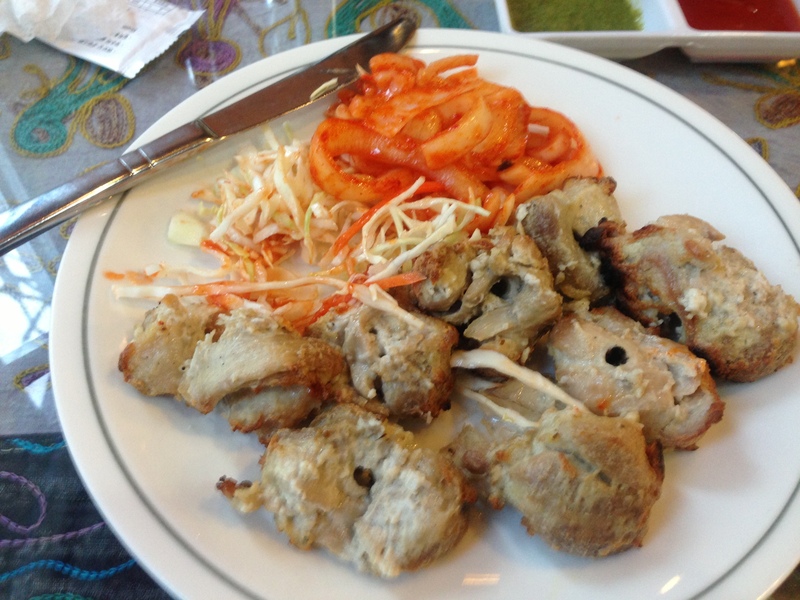 So I started on the kebab which looked scrumptious, and the actual taste did not disappoint. According to the menu, the boneless pieces of chicken are roasted in a Tandoori oven with cheese, cream, cashews, and spices. All of these elements came together to form a harmonious flavor profile. It was on the milder side compared to other Indian dishes, but the chicken was succulent with nutty undertones that were accented with some charred notes from the intense heat of the oven. The sauces, one green chutney infused with cilantro and one sweet red chili sauce, definitely kept the dish from becoming too boring. On the side, there was a fresh cabbage salad with some of the same red chili sauce on it, but I preferred the cooked, chili coated onions. They were not spicy, but I enjoyed employing them in a tag-team of intense flavors with the green chutney when eating the chicken. 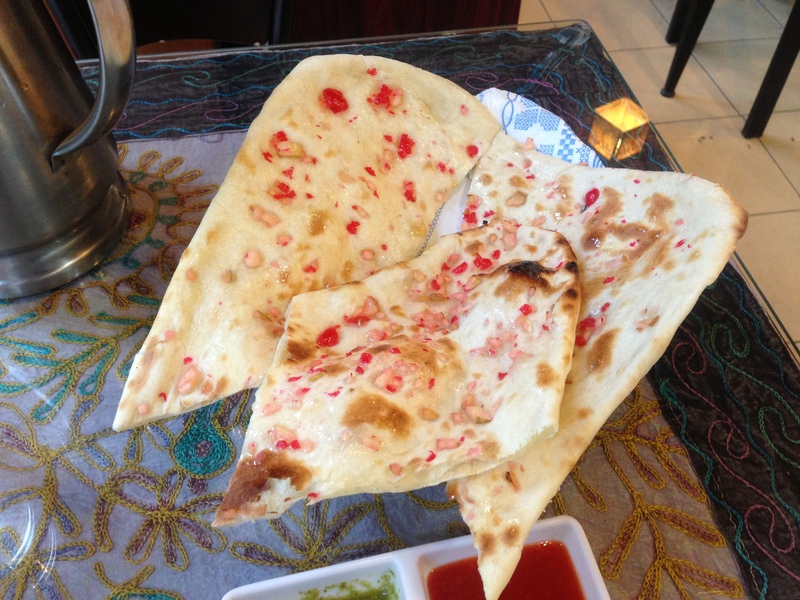 Just when I thought my appetite was down for the count, I turned my attention to the Himali naan. The three enormous pieces of warm flatbread looked very enticing because they were coated in pieces of apples and cherries. Normally, I’ve had savory naan with garlic or peas, so this Nepali twist allowed me to indulge my sweet tooth. From the first bite, I knew that I made the right choice. The bread was warm, soft, and pliable with just the right amount of crispiness on the surface. In terms of flavor, it was a fitting dessert as the buttery foundation of the bread served as the canvas for the broad strokes of smooth apple and the tart, staccato cherry accents. By the time I finished, I was thoroughly satisfied and felt it was a worthy trophy meal after such an active day. Upon leaving, the owner asked me where I was from, and thanked me for coming in and gave me his business card. Just another fleeting moment of great service during my dining experience. 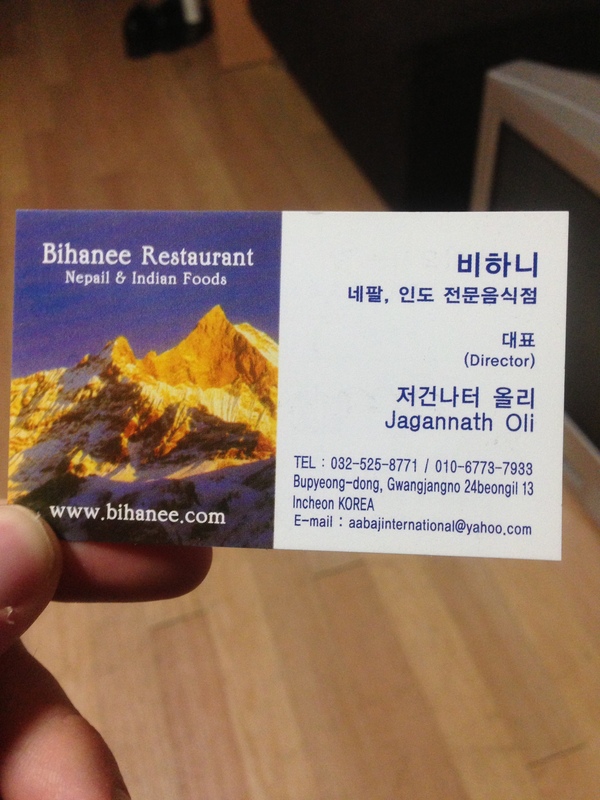 So if you want to try a cuisine that is as rare as the abominable snowman and more satisfying than climbing Mount Everest (individual experiences may vary), then head on over to Bihanee and Mr. Oli will treat you to a fantastic meal. 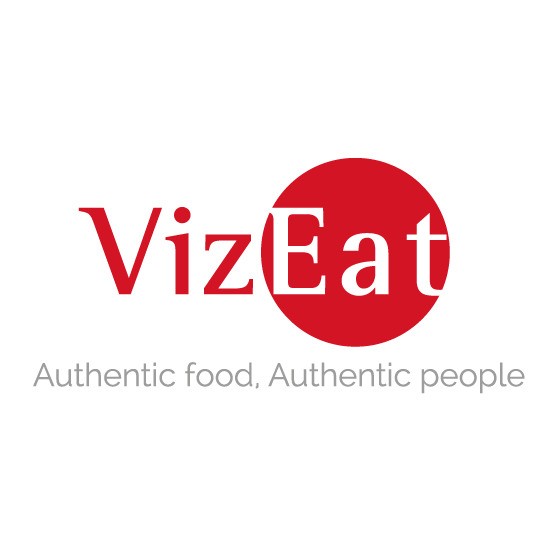 Posted in Indian, Nepalese, Southeast/Southern Asia Cuisine and tagged authentic, bread, cheese, chicken, chutney, dining, Food, grill, Indian, Korea, naan, Nepal, nuts, peppers, restaurant, Reviews, salad, sauce, sweet. Bookmark the permalink. Please Mark, write a book as soon as you can. Your writing ” Is just out of this world”. You can definitely make a living as a writer. Tasty Tasty. This might be one of the more delicious looking “Korean” meals.